Packed with personality and made with you in mind, the FIAT 500 is fully customisable with impressive fuel efficiency and keeps safety and security a top priority. This award-winning compact car was a 2013 IIHS Top Safety Pick. 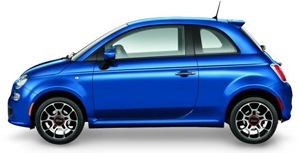 Learn more about each FIAT model and its fuel economy. Make it yours as an expression of your individuality. Enjoy the ride with an impressive fuel economy of up to 6.4L/100 km in the city and 4.9L/100 km on the highway. 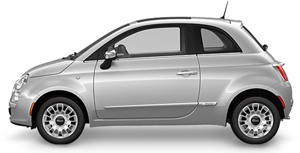 The FIAT 500 Sport has an unmistakable European-inspired look and plenty of pick-up and go. This FIAT 500 Sport is an attention grabber with its 16 inch cast aluminum wheels and red Brembo brake calipers. Its 6.4L/100 km city and 4.9L/100 km highway fuel efficiency will keep you driving longer. The FIAT 500 Lounge is the definition of effortless style and refined comfort. Packed with standard features that will make driving a dream such as the automatic temperature control and Sirius XM satellite radio. The FIAT 500 Lounge has 6.4L/100 km city and 4.9L/100 km highway fuel efficiency that makes stopping for fuel a distant memory.